Hello. Things are sure quiet here in regards to this phone. I am reading as much as I can to help decide if I really want this phone. It hits most of the checkmarks for me, but am concerned about the "software" . The other phone I am looking at is the Pixel 3XL. So, how do you like the Mate 20 Pro, especially in terms of the software and user experience? The defects will all get sorted in time I am sure, I just want to get an AWESOME phone! So in terms of software, EMUI does take some getting used to, you will either love it or hate it. For me the phones Battery Life and UI Speed have made me really like EMUI, as it seems Huawei have struck a balance of building a UI that is both fast and efficient. It does NOT look as good as stock Android or Samsung Experience UI. EMUI is a different take on Android, it's customisable and has some nice features e.g being able to make the UI Dark (Black) so it's easier on the eyes and Battery. There is also a lot of Machine Learning going on in the background, the device seems to be trying to learn your usage patterns and so it adjusts the way it handles apps and can be quite heavy handed at times in closing them, this is something you can stop by turning off Automatic App Management in the App Launch menu in the Battery Settings. Some launchers like Nova Launcher seem to have issues especially when using the Gesture based system navigation (which I am using), I personally stopped using 3rd party launchers back in 2013, as they didn't always play well with built-in widgets of the phone (this was on Samsungs I had) and I have not gone back to them since, but for the sake of trying, I did try Nova Prime which I bought some years ago and can confirm it didn't really run nicely on the Mate 20 Pro. so which is the good screen? the LG or BOE? So torn...this phone totally has me interested, and I am out of town for the weekend and while looking at phones one of the guys working the biggest phone store is a Pixel owner and showed me some really cool things with his phone. Going to some other stores today for more playing while wifey is shopping..! So tempted by the Pixels software, but love the Mates hardware. Ugly, bloated icons plus the notch make this phone a no-go, sadly. "Sadly" because the phone is beautiful and it had excellent battery life. Oh, and the ****-taking price tag. 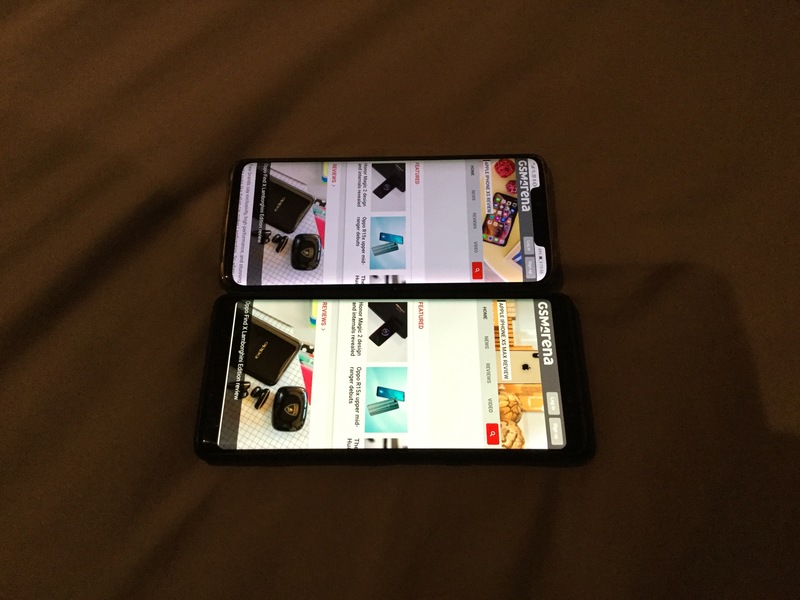 The notch I can live with, especially compared to the Pixel 3xl. I am all of a sudden not digging the curved front glass tho. Thank you for creating this thread! Always love reading these kinds of discussions. Also, I can vouch for the fact that EMUI may take some getting used to. I used the Honor 8 and I really loved EMUI. I loved its long range of customization and it seemed pretty close to stock Android. Will be interested to read more responses! dc52ltr and Tsepz_GP like this. Software wise it's the best, much better than stock, clean looks good and feature rich. Stock is boring ugly and featureless I think this phone is better than the Pixels in every way. Chinese BOE is the good one, Huawei is offering free exchanges though. Get the Mate while you can I'm in Canada too I've called every store here all ran out of stock except one Bell store. Virgin Mobile told me they had some in stock but they don't sell the phone outright, the offer they had was sign up for a two year term at 60 a month then you get the option to cancel the contract with no extra charge after 90 days. They'll also take 150 off the price of the phone and give you a free Huawei watch 2. Even though I'm with Freedom I eventually signed up just to get the phone since with the free watch worth 350 it's actually a good deal. Went to get something to eat came back and Virgin ran out of stock literally in 30 minutes or so, Bell had just one in stock the guy went to talk to the people at Bell but they wouldn't transfer it to him. I called every other Virgin store here afterwards none had stock left, since Virgin Mobile is under Bell as a last resort I went back to Bell to talk to the people who worked there the girl said she had seen me in the store earlier asking about the phone I explained my situation to her finally she agreed to call her manager and gave me the phone. A lot of hassle but worth it in the end, in terms of cool features this trumps the Pixels any day and is pretty much a better phone in every area. Try it out you can return or exchange it in 15 days. Yeah, guess I could try it out. Was sort of leaning towards the lean Android feel of the Pixel, am looking for a hassle free phone this time...! I will wait a bit, have a brand new BlackBerry Keyone (warranty replacement). Realistically good for now, but so wanting something new!! 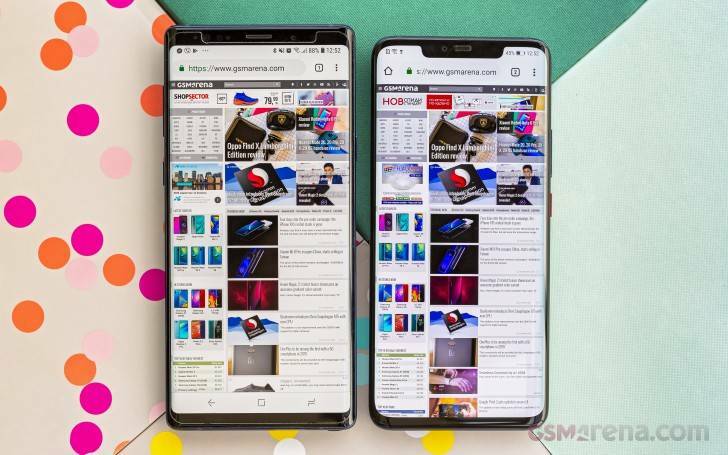 GSMArena Mate 20 Pro next to Note9. chrispmoto, TonyHove and gnote2tmo like this. I know that Huawei is offering free exchanges for the defective phones. The issue is that this has to take in the region it was manufactured. Mine I imported is from Singapore so we'll see how that goes. For Huawei to do an exchange it has to be within the country that model belongs to so don't import it. I haven't been able to contact Huawei Singapore where mine is from. I recently got the mate 20 pro and switched from an HTC U11. I have always loved HTC phones and how fast and smooth they remain, but sadly HTC just seems to be going from bad to worse financially. I'm loving the mate 20 pro. The battery is amazing. Never had a phone with a batter like this. Screen is great, nice and bright. UI is very smooth and to be honest, I don't have an issue with the UI at all. A couple of minor things but overall is fast and smooth. The only thing that is weak on the phone is the sound through the loud speaker. Seems a little on the quiet side to me and not as good as the HTC phones. I tried with headphones and that's obviously better, but again, not as good as HTC but good enough. It is missing WiFi calling, which I had on the HTC. Not sure why there is no WiFi calling, maybe something that will be unlocked in a future update since I read it was available and initially and went away with the first update. Tsepz_GP and TonyHove like this. I used Emui for about a couple of weeks. Works like it should. it's a launcher after all and it was fine. 1) No swipe up for app drawer. I was spoiled by Nova with this nice feature. 2) When opening an folder, the pop up will appeared in the middle of the screen instead of near the app. Where it's more convenient and one handed friendly like in Nova. Beside those everything works just fine. Works like it should. No slowdown or lag. Yes, Huawei cannot match HTCs BoomSound at all or LGs DAC, but they do a good job for most in terms of audio, one of those areas we hope Huawei will push forward in next year, along with better Video Recording. Heck even in the mid range Mate 20 Lite is amazing with its Kirin710 and 3750mAh battery, I was getting about 7-8hours SOT with the Mate 20 Lite, so around the same as what I am getting with the Mate 20 Pro. I don't see that at all. It is simply missing. Yes, all the others, but Wi-Fi Calling is simply not there. Lookout says it is using battery How do I make it stop or remove the app?